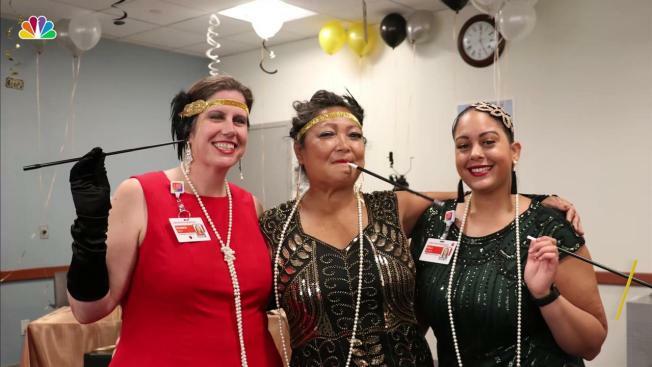 Seniors at the NewYork-Presbyterian Allen Hospital Lindy Hopped like it was the roaring 1920’s at their senior prom Monday. The annual prom’s theme this year was The Great Gatsby. Prom-goers dressed in their best flapper-esque attire and feathered headbands for the ladies, suit and tie for some men. RoseMary Cortez, program administrator at NewYork-Presbyterian, explained that the hospital began to throw an annual prom after Vickie Carl, a patient at the hospital, missed her own and decided to host a prom for herself and for those who also missed out on theirs. Carl passed away last year, but the tradition of prom at the hospital lives on in her memory. Patients who can’t dance said they still enjoy going to prom every year, dressing up, and watching everyone have fun. It was a party even Gatsby himself would attend.